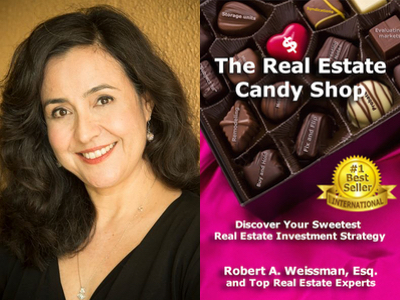 Congratulations to Linda Pliagas featured in the #1 Int’l Bestseller, The Real Estate Candy Shop! Realty411 was founded in 2007 by Linda Pliagas, who is the Publisher/CEO. Linda has personally owned and managed 24 multifamily units and three single family homes simultaneously in five states — all by the age of 38. Linda has purchased single family homes, multifamily units, vacation rentals, probates, REOs and short sales. Linda has worked simultaneously in media and real estate for the past 12 years. 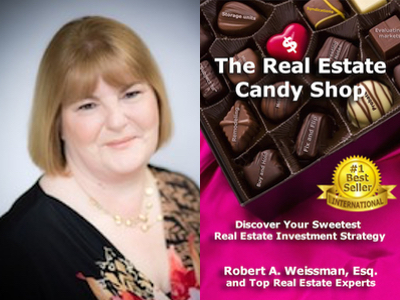 Congratulations to Roberta Eastman featured in the #1 Int’l Bestseller, The Real Estate Candy Shop! Roberta E. Eastman is America’s Leading Business Management Medic for Real Estate Investors and 3 time best-selling coauthor of Wounded, Survive, Thrive!! !, Ready Aim Inspire! and Ready, Aim, Influence! She specializes in transforming real estate investors from hobbyist to business owners. Partnering with them, she supports their efforts to build financial independence through cash flow and profit. Bringing 20 years of business leadership, her passion for empowering people to focus and to be fearless in moving forward is at the soul of her relationships. Based on her professional understanding of what gets results united with emotional intelligence, Roberta steers people to define and get the results they want in both their life and business. 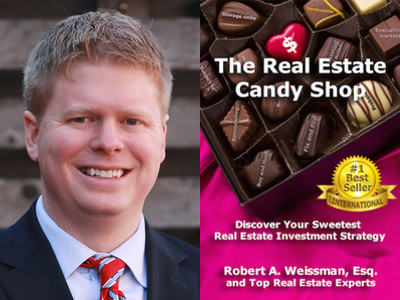 Congratulations to Jay Moss featured in the #1 Int’l Bestseller, The Real Estate Candy Shop! Jay Moss is the Chief Marketing Officer at Woodside Homes, which is one of the largest home builders in the nation. Jay has helped implement a strategic growth plan, the creation of new home designs and a focus on positive buying experiences, as well as a company-wide integration of the innovative “Better by Design” program that offers flexibility for buyers to personalize their homes with a design palette that suits their tastes. Jay has been with the company since the closing of several recapitalization transactions ranging from a $75 million equity offering to a $220 million debt issuance, which have significantly increased the company’s liquidity and strengthened its balance sheet. Under his sales and marketing leadership, Woodside closed over 1,400 homes in 2014 and has consistently been profitable since the first quarter of 2012. 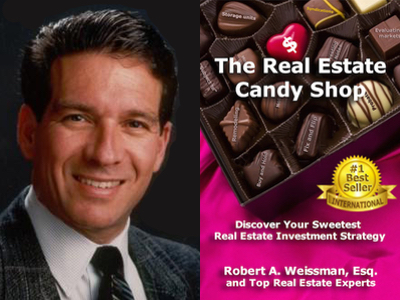 Congratulations to Jon England featured in the #1 Int’l Bestseller, The Real Estate Candy Shop! Jon S. England, CCIM, SEC is a Principal at his real estate firm specializing in Investment Sales, Self Storage, Multifamily and Strategic Consulting. Jon attained the CCIM designation and is the only Missouri Broker that currently has membership in the Society of Exchange Counselors (SEC), a national “by invitation only” real estate group that holds regular marketing sessions around the United States, which Jon attends on behalf of his clients. Through specialized education, Jon has expertise in all types of real estate, marketing methods, and exchanging of property assets to accomplish creative solutions to all types of investment goals and problems. 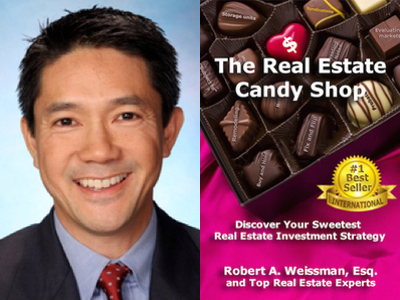 Congratulations to Ellis San Jose featured in the #1 Int’l Bestseller, The Real Estate Candy Shop! Ellis San Jose is full-time investor, licensed real estate broker and investment advisor in Westlake Village, California. Recognized as an expert on real estate, trust deed and note investing, he has been interviewed by CNN Money Magazine, appears in the book FLIP from the national best-selling “Millionaire Real Estate” series, and is also a featured lecturer at UCLA. Ellis is passionate about sharing the story of his journey from working as a stockbroker and trusted investment advisor, and his transition to becoming a full-time real estate investor. Ellis spends his time buying and selling real estate and notes, advising select investment clients and, serving as a board member for FIBI (For Investors By Investors), a nationwide mastermind network of investors he co-founded in 2007. 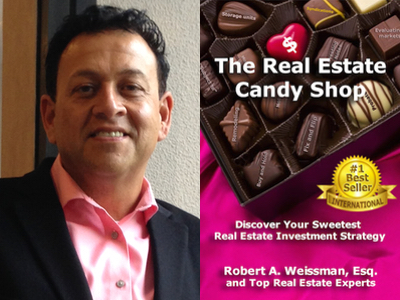 Congratulations to Mike Torres featured in the #1 Int’l Bestseller, The Real Estate Candy Shop! In 1980, a young man named Mike Torres came to America with one mission – to buy his mom a house. In addition to buying his mom a house, he built a thriving real estate business by approaching the market in a unique way. Today, Mike Torres, co-founder of MTI Education, helps people from all walks of life reach their dreams by teaching them time-proven methods that worked for him and his family for the last two decades. His secret key is investing in real estate using the probate court system in America. During his teaching career, he bought his first probate home and earned over $130,000 profit in less than two months. This check represented more than three times his yearly teacher’s salary. His life changed forever. 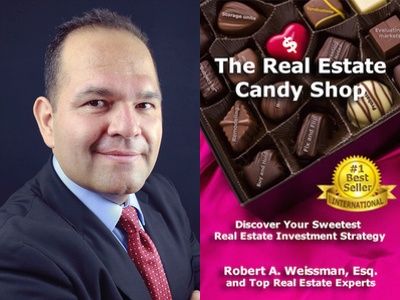 Congratulations to Anthony Patrick featured in the #1 Int’l Bestseller, The Real Estate Candy Shop! Anthony Patrick is a founding member and CEO of New Harvest Ventures LLC. and Real Estate Wealth Builders. He was also a member of White Rock Capital. He is a seasoned real estate investor, with over 15 years’ experience in several aspects of investing. With his passion to help others build their own wealth portfolios through real estate investments, Anthony brings a unique perspective to the table. With his background as a handyman, home inspector, property manager and real estate mentor, Anthony has educated thousands who want to invest and achieve success through his one-on-one training. Anthony has many years of experience flipping homes, and also has been involved in a variety of other kinds of real estate investing. Some of those include but are not limited to wholesaling, REO (real estate owned) auctions, courthouse auctions, short sales purchases, probates, pre-foreclosures, Commercial real estate, lease options, rentals and storage facilities. His vast knowledge in these and other areas of real estate finance and investing have proven to be life-changing for both Anthony and his students.